Home Posts Tagged "Barb Kalbach"
Many issues were discussed in the gubernatorial debate last Wednesday night, but one got short shrift: Iowa’s clean water crisis. Iowans across party lines want clean water and air. But pollution from corporate factory farms is making that impossible, as millions of gallons of untreated waste ends up in our waterways. Fortunately, more and more Iowans are taking a stand. One in five Iowa counties have passed a resolution or sent a letter to the state in support of stronger permitting standards, local control, and/or a moratorium on factory farms. The CCI Action board of directors sees Iowa's 2018 governor's race as an opportunity to inject our style of progressive populism into the race to do politics differently. I’m excited to announce that CCI Action has decided to start a formal endorsement process for the governor’s race. Advance our organizing campaigns, by making candidates take a stand on our issues. 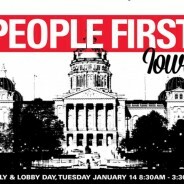 Build our people-power base, bringing like-minded Iowans into our work. Train ourselves on doing electoral field work – knocking on doors, making calls, talking to voters, etc. Ultimately, we want to lay the groundwork for a possible co-governing relationship – where elected officials govern hand-in-hand with movement organizations like CCI Action. As a cardiac rehabilitation nurse in rural Iowa, I spent 10 years helping patients recover from procedures like valve replacements and heart bypasses. I saw patients survive against the odds, thanks to incredible health care provided in our state’s rural hospitals. Now all of us in rural Iowa – including our hospitals – face a grave threat with the health care repeal passed by the House. The only way we’ll survive is by making sure our senators stop it. That includes our Senators Grassley and Ernst, who will put a whole lot of our children, parents, and grandparents at risk if they vote for this terrible health repeal. The Congressional Budget Office says the legislation will throw 23 million people off coverage – with 14 million tossed off Medicaid alone. An older person with limited income will be hit with premium hikes as high as 850 percent. I won’t mince words. This legislation is heartless. Iowa Citizens for Community Improvement Action Fund (Iowa CCI Action Fund) members unanimously approved the community organization’s 2014 “People First Iowa" agenda legislative agenda during a statewide strategy session December 7 attended by dozens of key CCI Action Fund leaders from across Iowa. The full text of the document may be read here.